With new programs and standards emerging, digital badges are helping students prove what they've learned in--and outside--school. This article appears in the May 2013 issue of T.H.E. Journal. Subscribe here for free to receive an email when the issue is released. March was a big month in the world of digital badging. The MacArthur Foundation showcased winners of its Badges for Lifelong Learning competition at the Digital Media and Learning Conference in Chicago--one year after awarding those winners $2 million worth of development grants. The city of Chicago itself announced that badging would be a key component of its Summer of Learning program, which is being called the largest citywide learning campaign in the country. And after 18 months of development and testing, the Mozilla Foundation, maker of the Firefox web browser, unveiled version 1.0 of its Open Badges Infrastructure (OBI) specification. These developments signal the fast approach of a tipping point for digital badging in K-12 education. According to Sheryl Grant, director of social networking for the Digital Media and Learning Competition, "I think it's fair to say that most of the discussion and on-the-ground building of badge systems so far has been about K-12. We're seeing a substantial use of badging at the K-12 level, partly because many of the developers of badging platforms and systems are focused on that level, but also because K-12 educators have proved to be open to badging." Grant works for the Humanities, Arts, Science, and Technology Advanced Collaboratory, better known as HASTAC (pronounced "haystack"), which administered the most recent MacArthur competition, the fourth such contest and the first to focus on digital badges. Cosponsored by the Bill & Melinda Gates Foundation and the Mozilla Foundation, the competition drew nearly a hundred competitors. A long list of organizations committed to providing resources for the development of badge-related content, including Intel, Microsoft, NASA, the US Department of Veterans Affairs, and the 4-H Council, among others. 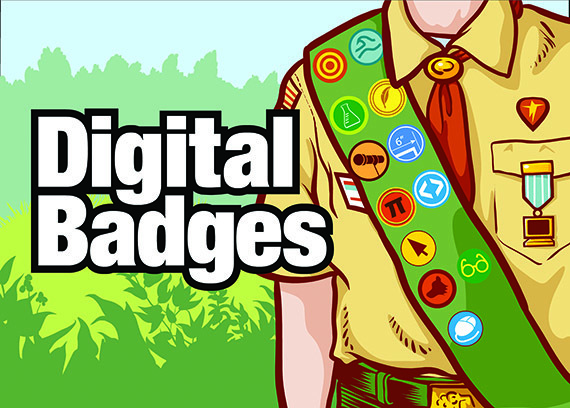 Why are all these organizations using their considerable weight to promote the development of digital badges? "People are very excited about the possibility of opening up new pathways for learning, of making it possible for students coming out of high schools--but not necessarily going to college--to show competence," says Alexander Halavais, associate professor in Arizona State University's School of Social and Behavioral Sciences. "The college career path is a very narrow one, and it's expensive. Everyone shouldn't have to go down the same road, and digital badges have the potential to provide a system for giving credit for doing valuable, marketable things outside of school." That idea seems central to the support digital badges are receiving from the Obama administration. US Secretary of Education Arne Duncan called badging "a game-changing strategy," and offered a $25,000 prize for the best badge concept serving veterans seeking skilled jobs. (The "BadgesWork for Vets" project was among the MacArthur winners.) "Badges can help engage students in learning, and broaden the avenues for learners of all ages to acquire and demonstrate--as well as document and display--their skills," Duncan said when the MacArthur competition was announced. What's a Digital Badge, Anyway? These are still relatively early days in the evolution of the digital badge, and Grant admits that the recent storm of activity might have increased, albeit temporarily, the level of confusion about what it is we're talking about when we talk about "badging." On its Summer of Learning website, the city of Chicago defines a digital badge as "a validated indicator of accomplishment, skill, quality, or interest that can be earned in any learning environment." That's a good definition as far as it goes, but what it (and many others) leaves out is the essential technology that makes such a validation possible. Grant suggests that the best way to think of a digital badge is as a computer icon combined with metadata. A badge is an interactive image posted on a web page and connected to a rich source of information. "It's a direct link to criteria, evidence, issuer information, time of issue, even an expiration date," Grant says. "Because it can be linked to actual evidence of experience, a badge has the potential to bestow a credential that can truly validate a skill set or a level of knowledge mastery." In other words, says David Theo Goldberg, director of the MacArthur Digital Media and Learning Research Hub at the University of California, Irvine, and cofounder of HASTAC, unlike a grade or even a diploma, a digital badge has the ability to identify what a student has learned along the way. "If you say, 'I passed Physics 101,'" Goldberg says, "the question remains: How much do you really know about physics? What did you actually do, learn, or master in that class? [Digital] badging can answer that question in a way that a grade or, ultimately, a certificate or diploma cannot." Grant adds, "You don't often see actual proof of learning attached to a résumé, but you do with a badge. You can click through and actually see the curriculum. You could see the rubric, the multiple-choice test, a detailed portfolio. You can show a learning pathway. And there are a lot of different types of assessment you could tuck into a badge. It doesn't have to be tied to anything that we are already familiar with. This technology is giving people an opportunity to ask, 'How are we sure that we are truly assessing learning?'" Of course, no one expects badges to replace diplomas or résumés any time soon. But this still-evolving technology has the potential to drive the development of new ways of assessing K-12 students. Grant says. "We seem to be assessing knowledge, but are we really figuring out how people are learning? And that they're doing a good job of learning?" Badges are currently being used in K-12 schools primarily in two ways: as motivational tools (like gold stars), and as evidence of proficiency (like merit badges). Halavais is worried about the former application, but thrilled about the latter. "I'm very skeptical of the use of badging for motivation," he says. "That could produce a negative outcome. If acquiring the badges becomes the goal, then they become this extrinsic motivator that nobody really wants. The people who are designing these badges have to think very seriously about whether they are recognizing authentic learning, or just giving people a gold star, which we know doesn't work in education." According to Goldberg, "We've seen much more evidence of innovative experimentation and development in the extended K-12 space, starting largely outside formal institutions, edging their way in good part through the [MacArthur] competition initiative into the formal schooling space." And therein lies what is likely to be the most significant impact of badging technology on K-12 in the long run: its ability to allow certification to come from somewhere other than a school. Among the winners of the MacArthur competition is a good example of what Goldberg is talking about. Created by LearningTimes, the BadgeStack project is a set of plug-ins for the popular open-source WordPress content management system. The plug-ins allow any organization to design and manage its own badges. Jonathan Finkelstein, CEO of digital credential provider Credly and director of the BadgeStack project, says, "The question we all seem to be trying to answer right now is, 'How can we make it possible for learners in the K-12 age range to tap into learning experiences that happen outside traditional classrooms and use badges to connect those two worlds?'" Current users of the BadgeStack platform include the Smithsonian Institution, which began employing it last year to develop badges for its new Smithsonian Quests program, an offshoot of its SHOUT environmental education program. Lynn-Steven Engelke, director of programs for the newly renamed Smithsonian Center for Learning and Digital Access (formerly the Center for Education and Museum Studies), says the Institution uses badges to enable people to "drive their own learning experience with our resources." "Badging works perfectly for this," she says. "Students work at their own pace, and they choose what they want to work on. And it's designed to allow them to use our resources to do something in their communities. The badges connect the museum with students' communities and classrooms." Quest participants--mostly students, though it could be anybody--earn digital badges by proving their knowledge of a range of topics. For example, to earn the "Community Historian" badge, students attend the "Civil Rights: From Lincoln to Today" session of the museum's online education conference series, and then write their own lyrics to the tune of a familiar song (for example, "The Banana Boat Song (Day-O)" was transformed into "Freedom, Give Us Free-ee-dom.") To earn the "Portrait Reader" badge, students choose one of the 22 portraits and mini-biographies featured in the Smithsonian's National Portrait Gallery exhibit website, and then record and upload a short audio description of the figure in the portrait, including the person's name and "the role they played in making the United States a more inclusive and democratic nation." Other badges issued by the museum include "Arts Advocate," "Dirt Detective," "H2O Hero," and "Symbols Spotter." While Finkelstein says that the goal of the badge ecosystem is to tap into educational resources wherever they may be, badge issuers like the Smithsonian need a common standard if the badges they issue are going to be recognized as valid. That's why so many badging advocates are excited about the launch of Mozilla's OBI. "A common standard helps to create a movement around alternative forms of recognition," Finkelstein says. "We're all saying that there are other ways we can recognize learning, but the OBI gets us all on the same page, issuing compatible badges--which means that, when a learner gets certified, the badges they earn aren't going to be isolated or siloed, and that they can use them to tell the full story of who they are, what they've accomplished, and what they can do." The OBI comprises a set of technical specifications that allow badges to interoperate, a framework for badge repositories (dubbed Mozilla Backpack), and a set of application programming interfaces (APIs) designed to support the portability and verification of badges. The Mozilla spec is open source and free, and it's the ground in which the badging ecosystem is already growing. In fact, the official launch of version 1.0 was something of a formality, says Sunny Lee, product lead for the Open Badges initiative. The project has been under way for more than 18 months, and by the time the 1.0 spec was announced, more than 600 independent issuers of digital badges had already aligned close to 65,000 badges with the OBI. Lee says, "Our intention is to make all these various recognition systems, whether they're badge systems or certification systems, speak a common language and interoperate within an ecosystem for the benefit of the badge earner who is gaining recognition from a variety of different environments." The establishment of an open standard for digital badging has truly game-changing implications, says HASTAC's Grant, not just because it gets everyone on the same page, but because of the way it mobilizes the validating data. "What an open, digital badge allows you to do is to take that standardized metadata--and the reputation you build with it--with you as you move around the web," she explains. "Now you have the agency to show evidence of your learning, as opposed to a third-party issuer who says you have a diploma or a degree." Perhaps even more important than establishing a technology ecosystem, a standard can serve as the foundation of a community, Goldberg says. "Teachers can now plug into the OBI. There's a community now, and tech support. There's a set of experienced people, and more are emerging every day. You're not on your own any longer. It's a joint undertaking." Lance Christmann, executive director of EffectiveSC, a nonprofit that works with technology to raise social awareness, sees the Mozilla spec and the community that is forming around it as critical to badging's acceptance among educators. "To establish an open certificate that is commonly agreed on by a wide range of people is a difficult thing to do," Christmann says. "But it's essential to make sure that this form of credit is transferable among districts, and that it's something a student can use throughout his or her academic career and beyond." EffectiveSC is also another winner of the MacArthur competition. The company describes its project, called LevelUp, as "a learner-mentor connection platform that bridges the content and experiences students have anywhere in life to the reporting and progress required in school." EffectiveSC partnered with game maker Intrific and Adams County School District 50 in Westminster, CO, to develop a LevelUp-managed game that awards badges to students who apply algebra and geometry standards from the 8th- and 9th-grade math common core. Based on Intrific's "Outpost," but renamed "Space Wolf" for the Westminster High School Wolves, the game challenges players to apply math principles to determine the distances and angles among moving objects at particular points in time in order to "correctly laser meteor chunks that threaten human life." The game was developed with math curriculum experts at the University of Denver. Adams 50 is a public school district that operates on a competency-based system. According to Kevin Byers, project manager for the Gates Foundation grant that the school won in the MacArthur competition, "We are in a unique position to work with badges here at Adams 50. Our students move at their own pace through the content," he notes. "And they can progress through all their subject areas at their own pace. And that means that we can absorb these pieces of data from outside the system into a portfolio of proficiency that we're building for students. "The game we developed works well for us because it has the infrastructure that allows us to attach to a badge an understanding of proficiency based on standards," Byers adds. "If a student gets a bronze badge for a geometry game, for example, we confidently trust that the student has skills associated with three or four common math standards. It's evidence that validates this proficiency." The Adams 50 project is one of relatively few examples of badging being applied to in-school resources. Byers admits that a badging strategy becomes more difficult when a teacher is asked to integrate the points of data a badge represents into the traditional classroom and blend them into a student's grade. He says that there's no clear way "to make those badges valuable in the class, other than as motivators. That's why a lot of the badging projects out there are the motivating force and the seal of approval at the end of an activity, and it stops right there. But we think it could be more than that." EffectiveSC's Christmann agrees. "This is a tough nut to crack for a lot of people," he says, "because a traditional course is not set up for awarding credit for competencies." Which raises one of the knottier questions about the future of digital badges in K-12 education: Can a method of acknowledging extracurricular learning and creating an alternative learning pathway actually find a place inside a system that continues to measure progress by seat time instead of competency? Goldberg says it can, and he cites an example that may point the way. "Pathways for Lifelong Learning" is a badge system created by the Providence After School Alliance, working with the city of Providence, RI. The system, which was among the MacArthur winners, was designed to "expand and improve quality after-school, summer, and other expanded learning opportunities for the youth of Providence." The district was one of the first in the country to give academic credit to its 23,000-plus students for skills and achievements acquired outside the classroom. Providence's Rhode Island College has agreed to accept the district's badges on college applications as evidence of learning experiences and skill acquisition. Now that the MacArthur competition has "seeded the ecosystem," according to Mozilla's Lee, badging has a certain amount of momentum--which allows her organization to turn to other concerns. "There's a lot still to be done," Lee says. "For example, we need to create tools and services for the people who need to review the badges, so they can do that efficiently. Having more information out there associated with the badge is great, but it also puts a lot on the reviewer of the badge, who has to parse that information. We need to provide the tools for badge reviewers and potential employers. That's high on our agenda." And HASTAC's Grant admits that the education community still has a lot to learn about badging for K-12 students. "There are things we just don't know yet about how badging is going to impact the schools," she says. "But in the meantime, our community is made up of the advance teams that are going to make sure that digital badging is grounded in real practice and real use and real needs."